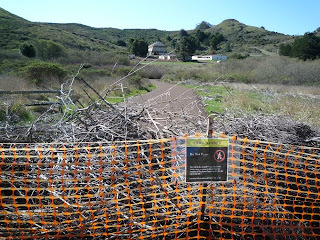 Local cartographer Ben Pease recently alerted me that construction in the Marin Headlands was altering the trailhead for my Gerbode Valley hike. After reading the project actions flyer I got the idea that the work was completed, so yesterday I cruised the scene. Work is definitely not completed. At first I couldn't find the trailhead -- piles of dirt and rubble block access to the eastern leg of the little spur road, and construction equipment is staged all around. The new bridge is in place (but closed until autumn) to the west of the old trailhead, but there is no formal trailhead parking near it, so I can't guess what is planned there. 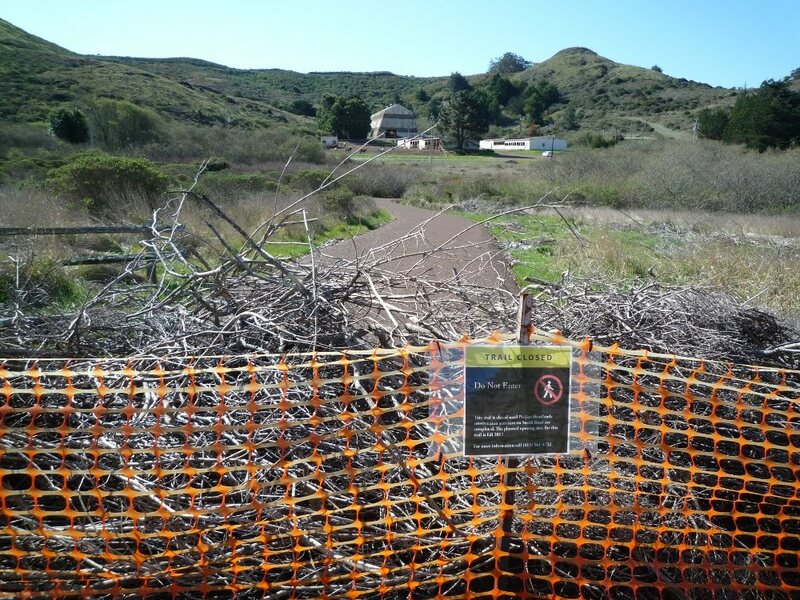 You can easily access the Gerbode Valley hike by parking on the side of Bunker Road west of the stables -- look for a small path signed to Miwok Trail, about 30 feet west of a reduced speed sign. If you get to the road junction at Fort Barry you've gone too far. Other Headlands improvements are obvious and pretty wonderful. The road junction at Conzelman and McCullough is now a roundabout. Conzelman is nicely paved and hosts new parking pullouts. I'm excited to explore more and this is a great time of year to do it.